Art 111. Experiencing Art (3) Prerequisites: None. Exploration of art and contemporary culture through viewing and discussing works of art, making art in various media, and critiquing classmate work. Developing creativity and discovery through viewing and discussing works of art from sources including The University Art Museum, School of Art (SOA) students exhibiting in SOA galleries, Los Angeles and other local art museums, and online exhibition spaces. The existing course Art 110: Introduction to the Visual Arts is being retired at the end of Summer Session 2018. From it 2 new General Education courses are being created, one focusing on Art History, and this course, Art 111 focusing on Experiencing Art. This is a C-1, The Arts, General Education course. Students will discover new ideas and perspectives on aesthetics and expression through considering the work of many artists. Weekly written analysis, face-to-face critique, and/or online critique will enrich their skills in critical thinking, and in the media and languages of art. Students will have the opportunity to leverage these new ideas through their own weekly art activities where they create works in a wide range of contemporary media. Frequent critiques will facilitate an understanding of how their work functions in dialog with the art and culture of their time. As an introductory course, students should feel safe in experimenting with new ideas and risk taking. 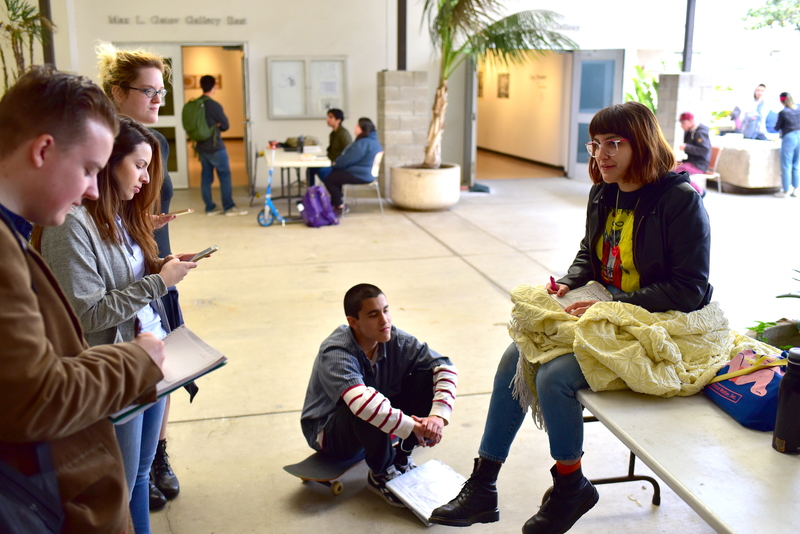 Art111 takes advantage of many opportunities to see art in the Los Angeles area and/or in local and online exhibition spaces, including the CSULB University Art Museum, the School of Art galleries, Los Angeles and other local museums and galleries, and online spaces. These opportunities will provide students from across the CSULB campus community with the opportunity to bring their own fields of study and life experiences to bear on the consideration of artists and their myriad forms of exploration of art, life, and culture in the 21st century. C. Strategies for Skill Development: Encourage diversity and facility for students by exploring a range of diverse art activities. A. Measurable Benchmarks: Through Projects, Conversations with Artists, and Conversations with Peers, students demonstrate new forms of formal and conceptual understanding and willingness to experiment and explore. B. Evaluation Instruments: face-to-face or online critiques and student essays. Critiques and essays should exhibit critical thinking and new insights into art, media, and aesthetics. C. Strategies for Skill Development: Feedback from instructor and classmates encouraging students to continue to expand their willingness to explore new media, new ideas, and the edges of art. A. Measurable Benchmarks: Art activities by students with fast feedback from faculty and classmates. B. Evaluation Instruments: Critiques & essays in face-to-face, online, or both formats. C. Strategies for Skill Development: Through Art Gallery visits students will engage in gallery culture and expand its dialog. Through Art Projects students will be encouraged to try new media and expand their technical, conceptual, and personal comfort zones. B. Evaluation Instruments: critiques, discussions & essays. C. Strategies for Skill Development: Group and individual feedback showing examples of where students have made connections to dialogs in art, life, and contemporary culture, and exploring pathways to deeper dialogs. Students will demonstrate a developing sense of self as a creative learner, building on prior experiences to respond to new and challenging contexts in the arts. B. Evaluation Instruments: critiques & essays. C. Strategies for Skill Development: Group and individual feedback showing examples of where students have demonstrated a sense of self as a creative learner. Examples of where students have built on prior experiences to respond to new challenges or how they might have more deeply connected prior experiences to new and challenging contexts. The following is a broad outline of topics to be covered. Subject matter and sequence of topics may vary by instructor. Art Activity – a range of media from traditional media like Painting & Sculpture to new media like Ephemeral Messaging & Game Design. Critique – many weeks should feature a critique, face-to-face or online or a combination of both, of the previous week’s Art Activities. Artists & Ideas – In face-to-face & hybrid sections of this course students visit the 5 CSULB SOA Art Galleries located in the Gallery Courtyard between FA2 & FA3. Here they view 4-5 new exhibitions each week and select one of the exhibiting artists for a conversation. In 100% online sections students view instructor-prepared and other videos, and artists’ websites. Online students use online discussion tools to critique works and discuss ideas. Conversation with a Classmate – students have a conversation with one classmate they don’t already know. They discuss background and career interests, look at art together (SOA Galleries or online), and discuss the “Question of the Week” together. Experiential Writing – essays on conversations with artists and analysis of art activities attempted. Sections of Art 111 may be offered in Face-to-Face, 100% Online, and Hybrid formats. Primary Sources: reading numerous artists’ websites from within the CSULB School of Art, and in the larger world of art beyond. Abramovic, Marina & Miguel Fernandez-Cid. Marina Abramovic: Student Body. Milan: Charta, 2004. Angell, Callie. Andy Warhol Screen Tests: The Films of Andy Warhol, Catalogue Raisonné. New York: Abrams, 2006. Berger, John and John Christie. I send you this cadmium red… New York: Actar, 2000. Blais, Joline and Jon Ippolito. At The Edge of Art. London: Thames & Hudson, 2006. Bourriaud, Nicolas. Relational Aesthetics. Dijon: Les Presses Du Reel, 1998. Brown, Kathan. ink, paper, metal, wood: Painters and Sculptors at Crown Point Press. San Francisco: Chronicle Books, 1996. Curtis, Gregory. The Cave Painters: Probing the Mysteries of the World’s First Artists. New York: Knopf, 2006. Davidson, Susan, et al. Joseph Cornell / Marcel Duchamp…In Resonance. Ostfildern, Germany: Hatje Cantz Publishers, 2008. Davis, Glyn and Gary Needham. Warhol in Ten Takes. London: British Film Institute, 2013. Finley, Karen. A different kind of intimacy: The collected writings of Karen Finley. New York: Thunder’s Mouth Press, 2000. Grody, Steve. Graffiti L.A.: Street Styles and Art. New York: Harry N. Abrams, 2007. Hables-Gray, Chris, et al. The Cyborg Handbook. Abingdon on Thames: Routledge, 1995. Heffernan, Virginia. Magic and Loss: The Internet as Art. New York: Simon & Schuster, 2016. Kaoru, Izima. Landscapes with a Corpse. Ostfildern, Germany: Hatje Cantz Publishers, 1998. Lewis-Williams, David. The Mind in the Cave: Consciousness and the Origins of Art. London: Thames & Hudson, 2004. Love, Courtney. Dirty Blonde: The Diaries of Courtney Love. London: Faber & Faber, 2007. McLuhan, Marshall and Quentin Fiore. War and Peace in the Global Village. Santa Rosa, CA: Ginko Press, 2001. Meyer-Hermann, Eva, Andrew Perchuk, and Stephanie Rosenthal. Allan Kaprow: Art as Life. Los Angeles: Getty Research Institute, 2008. Murphy, Caroline. Murder of a Medici Princess. Oxford: Oxford University Press, 2009. Panizo, Alfredo and Erlinda F. Rustia. Introduction to Art Appreciation and Aesthetics. Manila: Rex Bookstore, 1969. Quaranta, Domenico. Eva & Franco Mattes. Milan: Charta, 2009. Shaw, Jeffrey & Peter Weibel. Future Cinema: The Cinematic Imaginary After Film (Electronic Culture: History, Theory, and Practice) Cambridge, MA: MIT Press, 2003. Simons, Sarah. No one may ever have the same knowledge again: Letters to Mount Wilson Observatory, 1915-1935. Los Angeles: Society for the Diffusion of Useful Information Press, 1993. Suskin, Jacqueline. Go Ahead & Like It. Berkeley: Ten Speed Press, 2014. Tolokonnikova, Nadezhda and Slavoj Žižek. Comradely Greetings: The Prison Letters of Nadya and Slavoj. London: Verso, 2014. Traub, Charles & Jonathan Lipkin. In the Realm of the Circuit: Computers, Art and Culture. New Jersey: Prentice Hall, 2003. Weschler, Lawrence. Mr. Wilson’s Cabinet of Wonder: Pronged Ants, Horned Humans, Mice on Toast, and Other Marvels of Jurassic Technology. New York: Vintage, 1996. Zeki, Semir. Inner Vision: An Exploration of Art and the Brain. Oxford: Oxford University Press, 1999. Instructors may specify their own policies with regard to plagiarism, withdrawal, absences, etc., as long as the policies are consistent with the University policies published in the CSULB Catalog. It is expected that every course will follow University policies on Attendance (PS 01-01), Course Syllabi and Standard Course Outlines (PS 11-07), Final Course Grades, Grading Procedures, and Final Assessments (PS 05-07), and Withdrawals (PS 02-02). All sections of the course will have a syllabus that includes the information required by the syllabus policy adopted by the Academic Senate. Instructors will include information on how students may make up work for excused absences. When class participation is a required part of the course, syllabi will include information on how participation is assessed. Syllabi will include a rubric for how written communication is to be evaluated. Grading policies and procedures and the percentage of the course grade associated with each assessment must be explicit on each instructor’s syllabus. Instructors must develop scoring guidelines for assessments, which must be made available to students. Consistency across sections will be monitored through the School of Art Curriculum Committee, and the Head of the Foundation program will review the SCO and offer advice and/or materials to each faculty member new to teaching the course. All future syllabi will conform to the SCO. The responsible faculty or Head of the Foundation program may offer or require regular review of instructors’ course materials as well as anonymous samples of student work.